^ 1.0 1.1 最年轻的山脉喜马拉雅山. （原始内容存档于2012-01-17）. ^ 2.0 2.1 喜马拉雅山脉简介. enorth.com.cn. 2006-10-16. （原始内容存档于2011-12-20）. ^ Bishop, Barry. Himalayas (mountains, Asia). Encyclopaedia Britannica. [1 October 2012]. （原始内容存档于2014-08-17）. 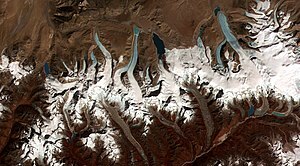 ^ The Himalayas: Two continents collide, USGS. [2014-08-11]. （原始内容存档于2017-11-17）. ^ Devitt, Terry. Climate shift linked to rise of Himalayas, Tibetan Plateau. University of Wisconsin–Madison News. 3 May 2001 [1 November 2011]. （原始内容存档于2014-08-13）. ^ Dallapiccola, Anna. 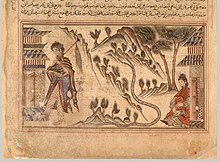 Dictionary of Hindu Lore and Legend. 2002. ISBN 0-500-51088-1. ^ Pommaret, Francoise. Bhutan Himlayan Mountains Kingdom 5th. Odyssey Books and Guides. 2006: 136–7. ISBN 978-9622178106. ^ Tibetan monks: A controlled life. BBC News. 20 March 2008 [2014-08-11]. （原始内容存档于2009-02-18）. ^ Mosques in Lhasa, Tibet. People's Daily Online. 27 October 2005 [2014-08-11]. （原始内容存档于2013-09-23）. 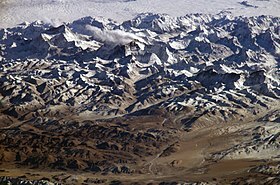 Gansser, Augusto, Gruschke, Andreas, Olschak, Blanche C., Himalayas. Growing Mountains, Living Myths, Migrating Peoples, New York, Oxford: Facts On File, 1987. ISBN 978-0-8160-1994-6 and New Delhi: Bookwise, 1987. 'The Mighty Himalaya: A Fragile Heritage,’ National Geographic Magazine, 174:624–631 (November 1988).